Copper ore is generally oxygen or sulfur, and sulfuric acid reaction of blue-green copper sulfate. Copper has a wide variety of natural copper color. Bornite copper was dark red, blue-violet oxidation becomes patchy; lead-gray chalcocite; copper blue is indigo; tetrahedrite is a steel gray; blue copper is bright blue. The world's proven copper reserves of about 6 million tons, reserves of most countries are Chile, accounting for about one-third of the world's reserves. The first stage of copper ore process within a metallurgical treatment circuit is copper ore crushing, where the copper ore particles are reduced in size such that copper particles can be efficiently separated from copper ore particles. The whole copper ore processing line consists of jaw copper pre crusher, ball copper ore mill, classifier, magnetic separator, flotation machines, thickener, dryers and other major equipments. Aggregate screen, bucket elevator and aggregate feeder can also be used in this copper ore processing. 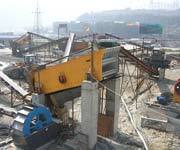 Copper ore crushing plant is most widely in copper ore process. As a professional mining crushing equipment company in China, we can supply our clients with jaw crusher, cone crusher, impact crusher and VSI crusher etc. Our jaw crusher is a good primary copper crusher, our impact crusher and cone crusher is widely used as secondary copper ore crusher. Otherwise, we also provide tertiary copper ore crusher. During this process, our hydraulic cone crusher and CS cone crusher, especially, the VSI vertical shaft impact crusher is excellent. Copper ore grinding plant is also usually applied. We also have many grinding mills to grind copper ores. Ball mill, Raymond mill, Vertical mill etc. are all frequently-used grinding machine. Our copper ores grinding machines have reached world-class level. Our company have been export our machines more than one hundred countries since our company set up.